Text: Judith 8:20-10:1 (verso). 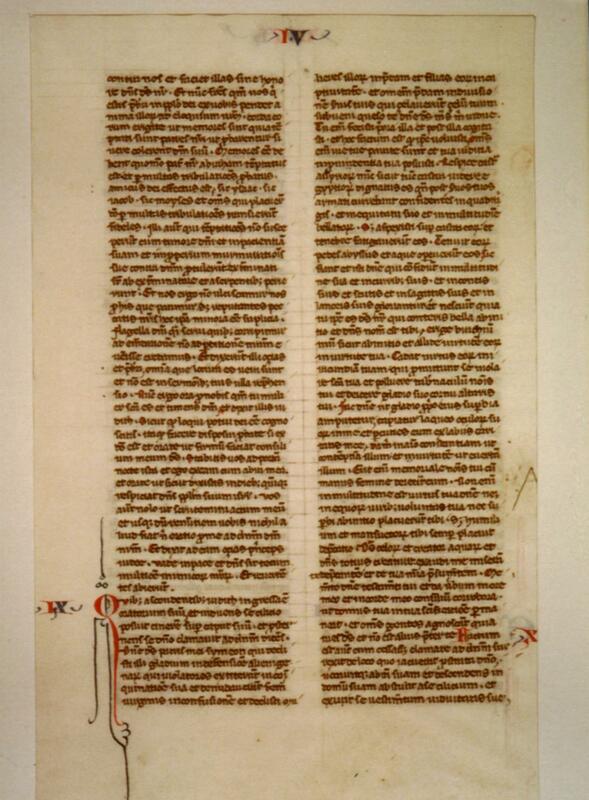 A scan of the recto is not currently available, but it likely contains the text of Judith 5:3-8:20. Reconstruction Note! In Ege's original manuscript, this leaf followed what is now Leaf 11 in the Ohio University portfolio. Together they contain Jerome's prologue and Judith 1:1-10:1. 20 Let us humbly wait for his consolation, and the Lord our God will require our blood of the afflictions of our enemies, and he will humble all the nations that shall rise up against us, and bring them to disgrace. 21 And now, brethren, as you are the ancients among the people of God, and their very soul resteth upon you: comfort their hearts by your speech, that they may be mindful how our fathers were tempted that they might be proved, whether they worshipped their God truly. 22 They must remember how our father Abraham was tempted, and being proved by many tribulations, was made the friend of God. 23 So Isaac, so Jacob, so Moses, and all that have pleased God, passed through many tribulations, remaining faithful. 24 But they that did not receive the trials with the fear of the Lord, but uttered their impatience and the reproach of their murmuring against the Lord, 25 Were destroyed by the destroyer, and perished by serpents. 26 As for us therefore let us not revenge ourselves for these things which we suffer. 27 But esteeming these very punishments to be less than our sins deserve, let us believe that these scourges of the Lord, with which like servants we are chastised, have happened for our amendment, and not for our destruction. 28 And Ozias and the ancients said to her: All things which thou hast spoken are true, and there is nothing to be reprehended in thy words. 29 Now therefore pray for us, for thou art a holy woman, and one fearing God. 30 And Judith said to them: As you know that what I have been able to say is of God: 31 So that which I intend to do prove ye if it be of God, and pray that God may strengthen my design. 32 You shall stand at the gate this night, and I will go out with my maidservant: and pray ye, that as you have said, in five days the Lord may look down upon his people Israel. 33 But I desire that you search not into what I am doing, and till I bring you word let nothing else be done but to pray for me to the Lord our God. 34 And Ozias the prince of Juda said to her: Go in peace, and the Lord be with thee to take revenge of our enemies. So returning they departed. 1 And when they were gone, Judith went into her oratory: and putting on haircloth, laid ashes on her head: and falling down prostrate before the Lord, she cried to the Lord, saying: 2 O Lord God of my father Simeon, who gavest him a sword to execute vengeance against strangers, who had defiled by their uncleanness, and uncovered the virgin unto confusion: 3 And who gavest their wives to be made a prey, and their daughters into captivity: and all their spoils to be divided to thy servants, who were zealous with thy zeal: assist, I beseech thee, O Lord God, me a widow. 4 For thou hast done the things of old, and hast devised one thing after another: and what thou hast designed hath been done. 5 For all thy ways are prepared, and in thy providence thou hast placed thy judgments. 6 Look upon the camp of the Assyrians now, as thou wast pleased to look upon the camp of the Egyptians, when they pursued armed after thy servants, trusting in their chariots, and in their horsemen, and in a multitude of warriors. 7 But thou lookedst over their camp, and darkness wearied them. 8 The deep held their feet, and the waters overwhelmed them. 9 So may it be with these also, O Lord, who trust in their multitude, and in their chariots, and in their pikes, and in their shields, and in their arrows, and glory in their spears, 10 And know not that thou art our God, who destroyest wars from the beginning, and the Lord is thy name. 11 Lift up thy arm as from the beginning, and crush their power with thy power: let their power fall in their wrath, who promise themselves to violate thy sanctuary, and defile the dwelling place of thy name, and to beat down with their sword the horn of thy altar. 12 Bring to pass, O Lord, that his pride may be cut off with his own sword. 13 Let him be caught in the net of his own eyes in my regard, and do thou strike him by the graces of the words of my lips. 14 Give me constancy in my mind, that I may despise him: and fortitude that I may overthrow him. 15 For this will be a glorious monument for thy name, when he shall fall by the hand of a woman. 16 For thy power, O Lord, is not in a multitude, nor is thy pleasure in the strength of horses, nor from the beginning have the proud been acceptable to thee: but the prayer of the humble and the meek hath always pleased thee. 17 O God of the heavens, creator of the waters, and Lord of the whole creation, hear me a poor wretch, making supplication to thee, and presuming of thy mercy. 18 Remember, O Lord, thy covenant, and put thou words in my mouth, and strengthen the resolution in my heart, that thy house may continue in thy holiness: 19 And all nations may acknowledge that thou art God, and there is no other besides thee.